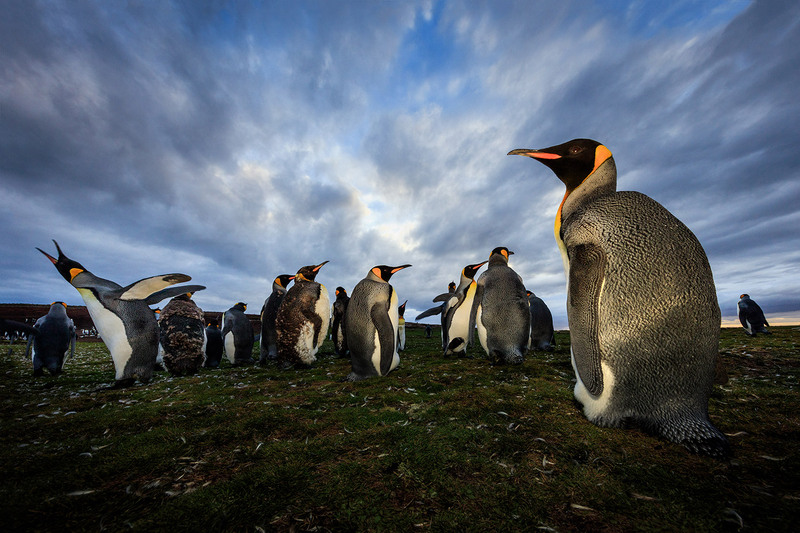 The Falkland Islands, located in the South Atlantic off the coast of South America, are world-renowned for their exceptional wildlife photography opportunities. Large, easily accessible colonies contain tens of thousands of some of the world’s most incredible birds, including five species of penguin, imperial cormorants, and black-browed albatross. Elephant seals, sea lions, and orcas are also commonly seen. Up-close-and-personal wildlife photography experiences are guaranteed! 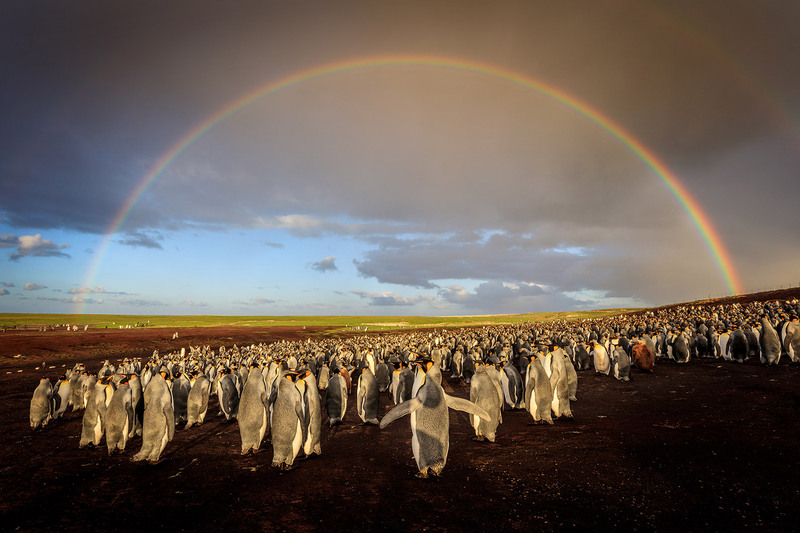 A rainbow appears over a king penguin nesting colony at Volunteer Point in the Falkland Islands. Canon 5DSR, Canon 11-24mm f/4 lens, ISO 100, f/7.1, 1/100 second. The Falkland Islands are currently serviced by only two limited flight routes. All flights arrive at the international airport in the Mount Pleasant Military Complex, approximately 37 miles from the capital city of Stanley. Most travelers arrive using LAN Airlines, which flies to the Falklands every Saturday morning (with return flights every Saturday afternoon), departing from Santiago and flying via Punta Arenas in southern Chile. Your second option is a 20-hour flight with the UK Ministry of Defence, leaving the UK on Sundays and Wednesdays (with Tuesday and Friday departures from the Falklands). 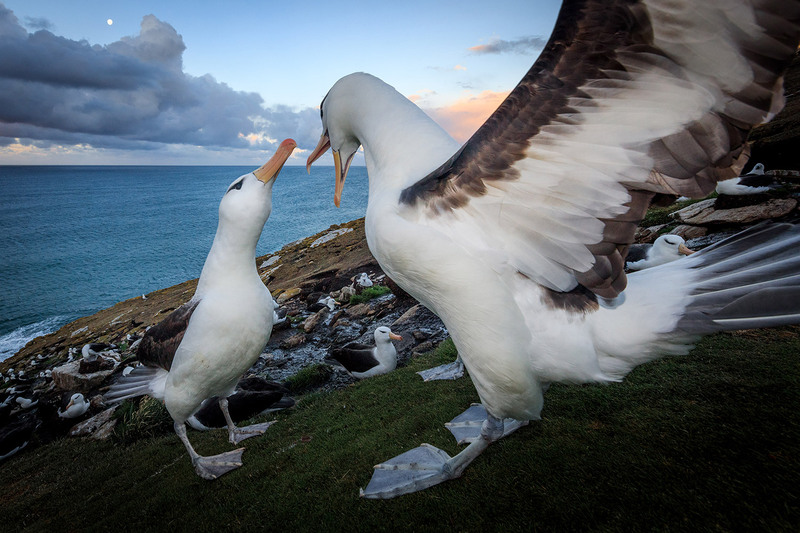 A pair of black-browed albatross engage in a courtship dance, Saunders Island. Canon 5DSR, Canon 11-24mm f/4 lens, fill flash, ISO 400, f/11, 1/60 second. The Falkland Islands Government Air Service (FIGAS), operating from Stanley, transports travelers to and from other islands in the archipelago. FIGAS operates a convenient “on demand” air service; just contact FIGAS and let them know when and where you need to be, and they will schedule a flight for that day (actual flight times vary depending on demand, FIGAS will let you know a day in advance when your flight will be, coordinating with you directly or through your tour or lodging providers). Note that the weather in the Falklands can be rough, so flight delays and cancellations are not uncommon. A Magellanic penguin guards its nest on Sea Lion Island. Canon 1DXII, Canon 200-400mm lens with built-in 1.4x converter, ISO 200, f/5.6, 1/500 second. Three of the most popular locations for photography in the Falklands are Volunteer Point, Sea Lion Island, and Saunders Island. Volunteer Point is on East Stanley Island and has a large king penguin colony; it is accessible only by driving two to three hours from Stanley on a sparse 4×4 track through wet terrain (you will need to hire a driver familiar with the area to take you there). There is limited lodging available at Volunteer Point; most visitors do day trips from Stanley. Sea Lion Island has a comfortable lodge, amazing scenery, and incredible wildlife, with large gentoo penguin, imperial cormorant, and rockhopper penguin colonies (as well as plenty of elephant seals and southern sea lions). The accommodations on Saunders Island are more basic and require self-catering, but the scenery and wildlife photography options there more than make up for the rustic lodging; huge albatross, rockhopper, and gentoo colonies await. But there are plenty of other amazing locations in the Falkland Islands, so get off the beaten path and explore! 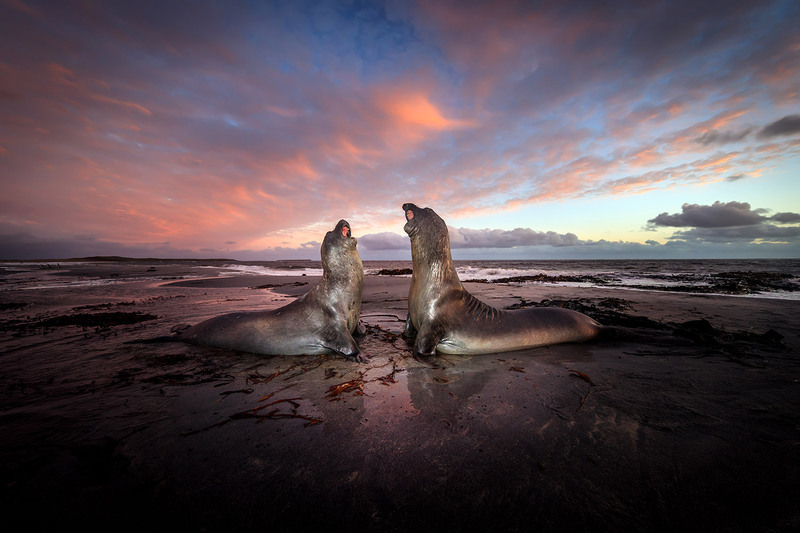 A pair of bellicose elephant seals sparring at sunset, Falkland Islands. I used flash at low power to gently illuminate the seals against the colorful sky. Canon 1DXII, Canon 11-24mm lens, ISO 400, f/5.6, 1/160 second. 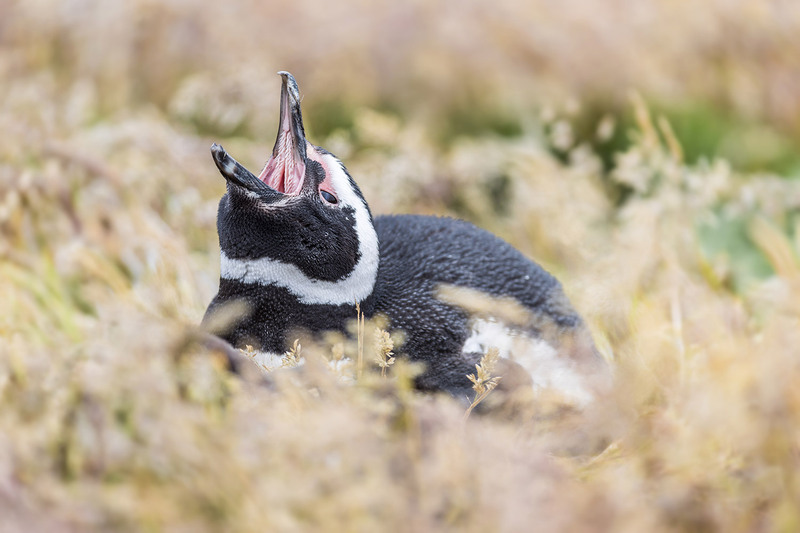 The best time to plan your Falklands visit is during the Austral Summer, particularly between the months of September (when a lot of the wildlife returns and mating begins) and April—with the peak months being December and January. Just about any time during the summer, however, you can see amazing wildlife activity. Albatross engage in mating rituals in September and October; cute elephant seal pups can be seen in October and November; eggs start to hatch in December and January; while in March and April, Magellanic penguins gather in large numbers on some of the beaches, preparing to head out to open water for the winter season. A telephoto view of an imperial cormorant roost containing thousands of birds on Sea Lion Island. Canon 5DSR, Canon 70-200mm f/4 lens, ISO 400, f/16, 1/50 second. Although the Falklands have plenty of wildlife, its tens of thousands of penguins are the main draw. 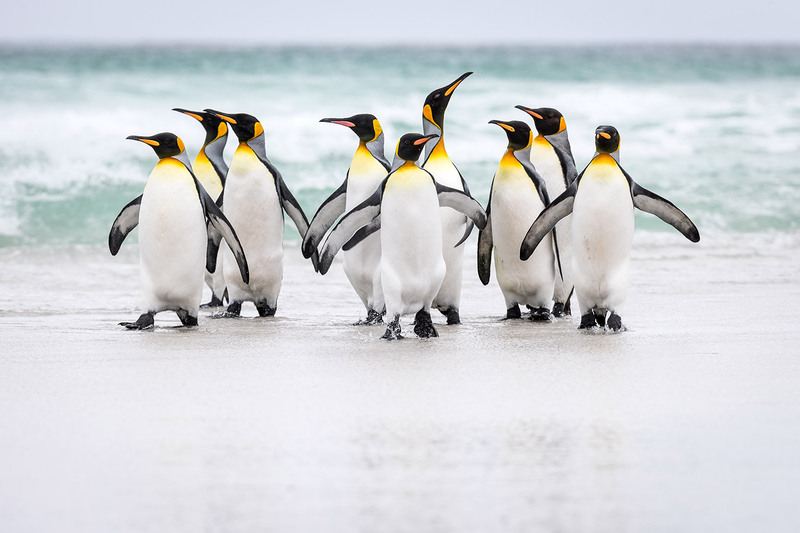 Five species of penguin make the Falklands their home, including majestic king penguins, feisty rockhoppers, inquisitive gentoo, and shy Magellanic penguins. The fifth penguin species, the oddly-named macaroni, is less common and difficult to spot, as they look like rockhopper penguins. King penguins can be seen in large numbers only at Volunteer Point. Rockhoppers are found primarily in places on the islands with large cliffs, which they prefer; it is amazing to watch these small but resilient birds ride large waves onto steep cliff faces, and then hop several hundred feet up to their clifftop nests. 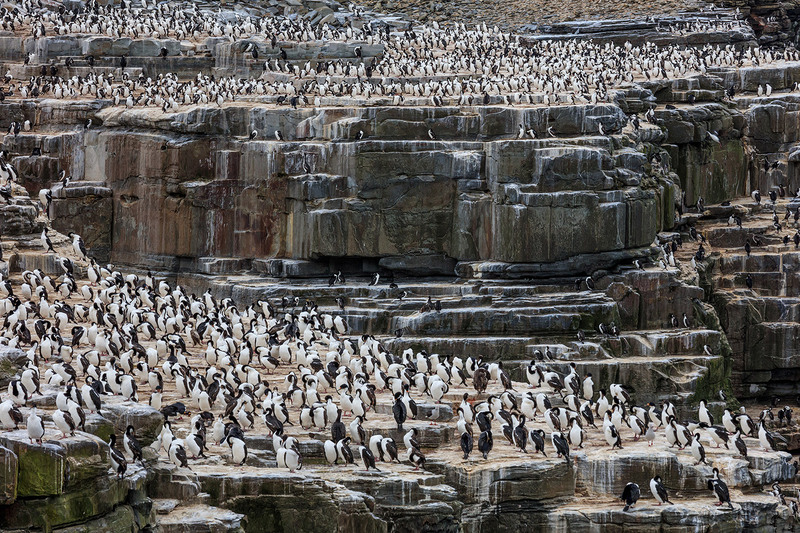 Large rockhopper colonies can be found on Sea Lion and Saunders islands. Gentoo and Magellanic penguins are commonly found in most locations in large numbers. A pack of king penguins heads out for a swim at Volunteer Point. Canon 1DXII, Canon 200-400mm lens with built-in 1.4x converter, ISO 100, f/6.3, 1/500 second. King and rockhopper penguins are quite tolerant of people, while gentoo and Magellanic can be more shy. But with a little bit of patience, most wildlife in the Falklands will tolerate a close approach. Penguins will often go out to sea and back in large numbers, offering interesting photo opportunities as they gather on the Falklands’ many scenic beaches. Getting down to ground level is often very effective, allowing for a more interesting perspective, especially when you have a colorful sunrise or sunset sky in the background. A longer lens will certainly come in handy, but wide-angle photography is also an option for close encounters with wildlife. Just make sure to avoid disturbing nesting birds, obey any local restrictions put in place to protect the animals, and be careful about getting too close to elephant seals or sea lions, which can be dangerous. To learn more, check out the instructional video course I shot with fellow Outdoor Photography Guide contributor Zac Mills while we visited the Falklands in January 2017. In the course, we discuss several techniques that will help you improve your wildlife photography. The course can be streamed for free for Premium Members, or you can purchase a separate video download. King penguins at twilight at Volunteer Point. Canon 5DSR, Canon 11-24mm f/4 lens, fill flash, ISO 400, f/14, 1/80 second. 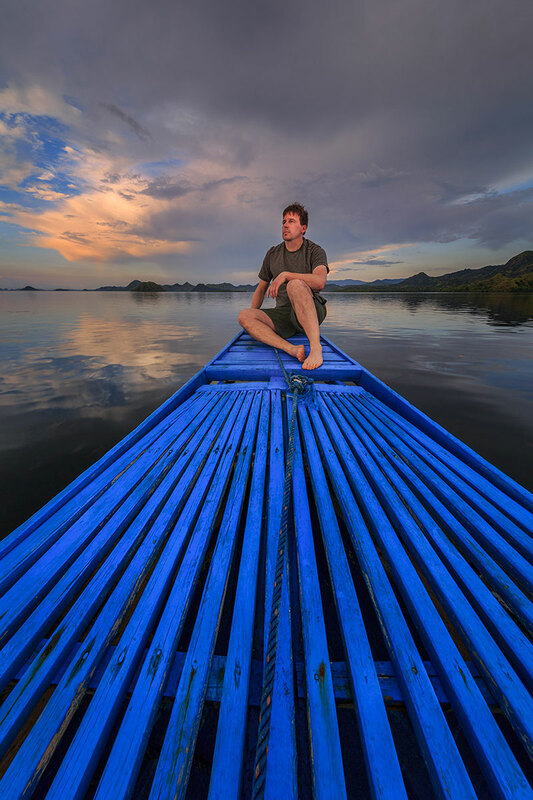 About the author: World-renowned professional photographer Ian Plant is a frequent contributor to many leading photo magazines, Managing Editor of Outdoor Photography Guide, and a Tamron Image Master. Ian is also the author of numerous books and instructional videos. Ian travels the world, seeking out the hidden spaces in between the familiar, in his never-ending quest to inspire and educate others in the art of photography. Visit his website to learn more: www.ianplant.com. Have something to add to the story? Leave a comment or email editor@outdoorphotographyguide.com. Ticket 23072 Where are the Islands located?